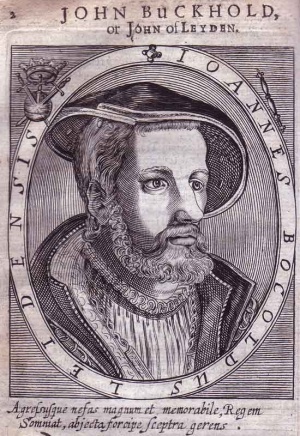 Jan Beukelszoon (also called Jan van Leyden [Leiden], John of Leyden, Jan [Johan] Beuckelsz or Bockelszoon), Anabaptist leader at Münster in Westphalia, Germany. He was born ca. 1509 at Leiden, Dutch province of South Holland. He was at first a tailor, then a merchant, and later an innkeeper; as a rhetorician he liked to act the part of King David. He was in many ways a highly gifted man, but his conceit and his self-love betrayed him. Be­cause he became an influential man with a large and devoted following, he founded an Anabaptist government at Münster, became king of this New Jerusalem, reigning there with absolute supremacy more than a year. Jan Beukelszoon, whose character was a mixture of shyness, ambition, and maniacal wickedness and yet not without germs of religious feeling, has been an enthralling mystery. Certainly he was much more than an ordi­nary adventurer. His conduct and acts, his fanati­cism, and his immorality did great harm to the growing Anabaptist movement of 1534 and the fol­lowing years, first because he misled a large num­ber of peaceful Anabaptists, especially of the Netherlands, winning them over to his revolutionary view that the kingdom of God was to be established on earth by the uprooting of the "ungodly," which in­cluded the use of weapons; secondly, because the world and especially the rulers of that time and later turned away with horror from Anabaptism, ignor­ing all distinctions between the outrageous disciples of Beukelszoon and the peaceful followers of Obbe Philips and Menno Simons. Until the end of the 16th century the Dutch government was filled with fear that the Anabaptists might repeat the revolution of Münster, and non-Mennonite authors, Roman Catholic as well as Lutheran and Reformed, even in the 17th century insisted that the govern­ments take action against the Mennonites in order to save the world from the horrors of Münster; the legend that Anabaptism and Mennonitism is de­rived from Jan van Leyden (Beukelszoon) and Münster continues to this day, even in the books of serious historians. All this is the consequence of the deeds of Jan Beukelszoon, the evil genius of early Anabaptism. Engraving from Apocalypsis, or The revelation of certain notorious advancers of heresie. London, 1655. Scan provided by the Mennonite Archives of Ontario. In November 1533 Jan Beukelszoon joined the Anabaptists, being baptized by Jan Matthijsz van Haarlem. Soon his house in Leiden became a center of Anabaptist activity. Cornelis Pieters wt den Briel and other leaders preached and baptized there. In December 1533 Jan Beukelszoon was sent out by Jan Matthijsz as an apostle to preach the Gospel, and first visited Alkmaar, Hoorn, Enkhuizen, then Den Briel and Rotterdam. Until this time the Anabaptist views of Jan Beukelszoon did not much differ from those of other Dutch leaders, who preached the coming of the kingdom of God, which the faithful had to wait and pray for, but under the influence of Jan Matthijsz he abandoned the peaceful principles. On 13 January 1534 he arrived in Münster, where he had paid a short visit in July 1533. 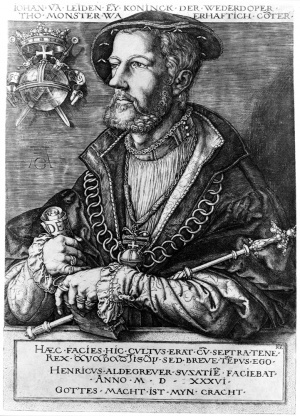 He soon ob­tained much influence in Münster, though then other leaders like Rothmann and especially Jan Matthysz, who came to Münster in February 1534, predominated. But after the death of Jan Matthijsz at Easter 1534, Jan Beukelszoon's influence increased and before July 1534 he reigned with absolute power. He organized the defense of the city against the army of Franz von Waldeck, Bishop of Münster, who had laid siege to the city. Com­munism of goods had been practiced since February 1534; in July of this year polygamy was introduced and in early September Jan van Leyden (Beukelszoon) was ap­pointed King of Zion (or New Jerusalem). In the meanwhile Jan Beukelszoon tried to strengthen the defense forces also by inviting the Anabaptists of the Netherlands and elsewhere, first by promises, then by threats that the world would perish and only those in the holy city of Münster would be saved. With much exertion and a surprising skill he defended the city against the episcopal army until the city was taken on 25 June 1535. Jan van Leyden (Beukelszoon), who had hidden in a cellar, was found and arrested. For a few months he was sent from one German dynastic residence to another as a curiosity. Then he was sentenced to death and executed in a very cruel way at Münster on 22 January 1536. There is a portrait of Jan van Leyden (Beukelszoon) in copper engraving by Heinrich Aldegrever, and an oil painting both of Jan and Queen Divara by Herman tom Ring (now in the Museum of Schwerin, Germany). Some of the abundant literature dealing both with Jan van Leyden (Beukelszoon) and the Münster period of Anabaptism in general is recorded in the article on Münster. Cornelius, C. A. Berichte der Augenzeugen über das Münsterische Wiedertäuferreich. Münster, 1853. Detmer, H. Johann von Leiden, seine Persönlichkeit und seine Stellung im Münsterischen Reiche. Mün­ster, 1903. Hege, Christian and Christian Neff. Mennonitisches Lexikon, 4 vols. Frankfurt & Weierhof: Hege; Karlsruhe: Schneider, 1913-1967: v. I, 240. Hoop Scheffer, Jacob Gijsbert de. Inventaris der Archiefstukken berustende bij de Vereenigde Doopsgezinde Gemeente to Amsterdam, 2 vols. Amsterdam: Uitgegeven en ten geschenke aangeboden door den Kerkeraad dier Gemeente, 1883-1884: v. I, Nos. 52, 82, 141. Kühler, Wilhelmus Johannes. Geschiedenis der Nederlandsche Doopsgezinden in de Zestiende Eeuw. Haarlem: H.D. Tjeenk Willink, 1932: especially 78-185. Mellink, Albert F. De Wederdopers in de noordelijke Nederlanden 1531-1544. Groningen: J. B. Wolters, 1954: See Index. Schubert, H. v. Der Kommunismus der Wiedertäufer in Münster und seine Quellen. Heidelberg, 1919. Rauch, W. Johann von Leyden, der König von Sion, in der Dichtung. Münster, 1912. Hermsen, Hugo. Die Wiedertäufer zu Münster in der deutschen Dichtung. Stuttgart, 1913. Zijpp, Nanne van der. "Beukelszoon, Jan (ca. 1509-1536)." Global Anabaptist Mennonite Encyclopedia Online. 1957. Web. 23 Apr 2019. http://gameo.org/index.php?title=Beukelszoon,_Jan_(ca._1509-1536)&oldid=144825. Zijpp, Nanne van der. (1957). Beukelszoon, Jan (ca. 1509-1536). Global Anabaptist Mennonite Encyclopedia Online. Retrieved 23 April 2019, from http://gameo.org/index.php?title=Beukelszoon,_Jan_(ca._1509-1536)&oldid=144825. Adapted by permission of Herald Press, Harrisonburg, Virginia, from Mennonite Encyclopedia, Vol. 3, pp. 77-78. All rights reserved.